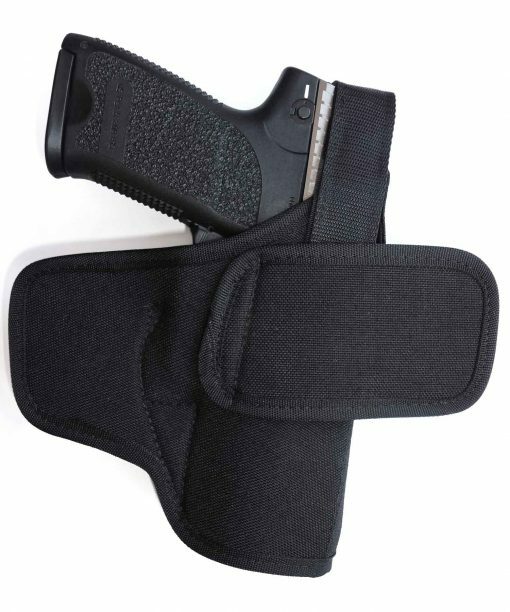 This pancake OWB belt gun holster uses belt loops at the front and rear of the holster to pull your handgun tight against your body for better concealment. The flat, low profile of this design effectively conceals your gun. 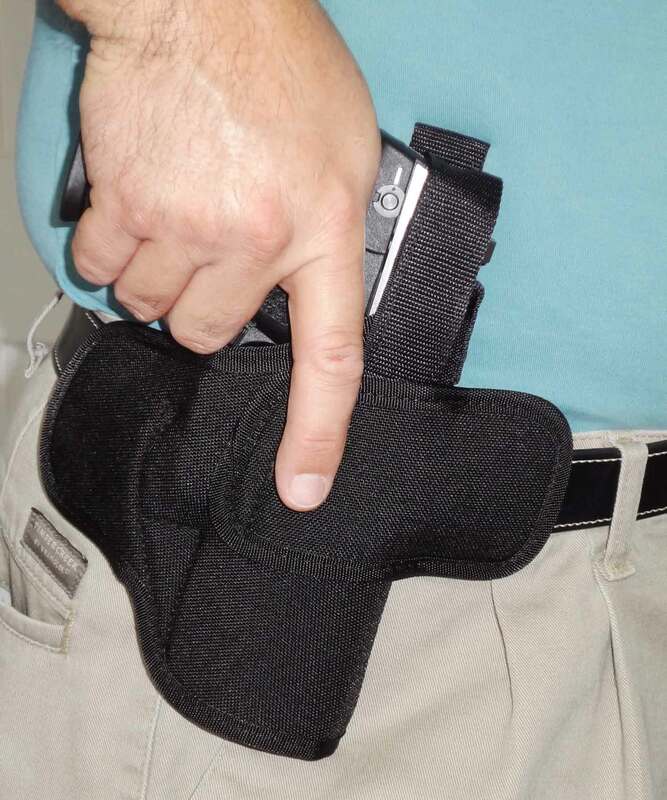 The holster contours to the shape of your hip and keeps your gun close to your body making it very comfortable for extended, all day concealed carry, even with large guns. 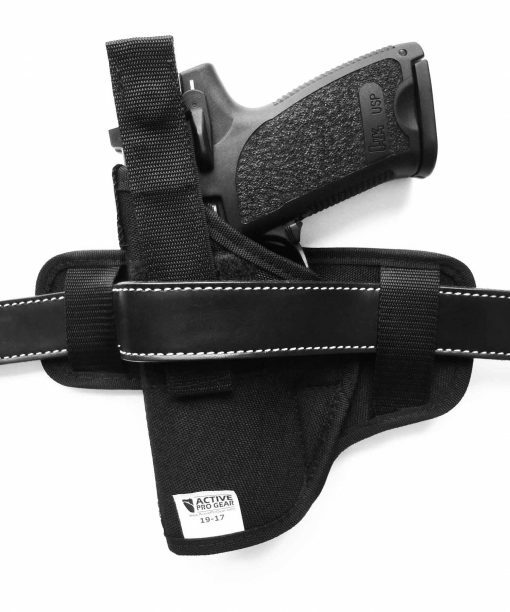 The OWB Pancake Belt Gun Holster for Concealed Carry attaches to the belt with two loops positioned in front and behind the gun to provide maximum stability and firm placement on your belt. 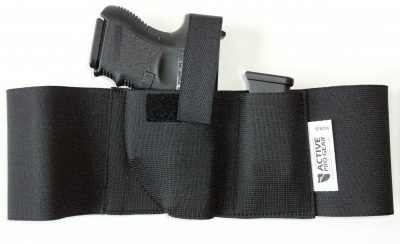 But unlike simple pancake holsters, the OWB Pancake Belt Gun Holster for Concealed Carry reinforced body maintains the holster open for easy one-hand reholstering. The holster will not collapse when you draw your gun. Forward cant places gun at the correct angle for superior concealment and quick, full combat grip, access to your gun. Comes with an adjustable thumb break for added security. The OWB Pancake Belt Gun Holster for Concealed Carry is a quality concealed carry holster designed for no-nonsense, practical everyday use. 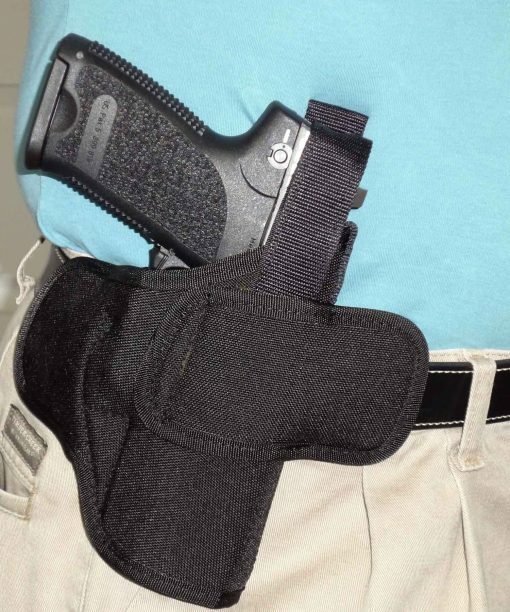 One of the most simple, comfortable and proven ways to conceal carry a gun on your belt. The OWB Pancake Belt Gun Holster for Concealed Carry is designed to be used on your strong hand side (2, 3, 4 o’clock positions). RIDES: Rides with a slight forward cant for a quick and smooth draw even while seated. IMMEDIATE ACCESS: You have immediate access to your concealed gun. QUALITY PRODUCT: Made from our special proprietary material made exclusively for Active Pro Gear. 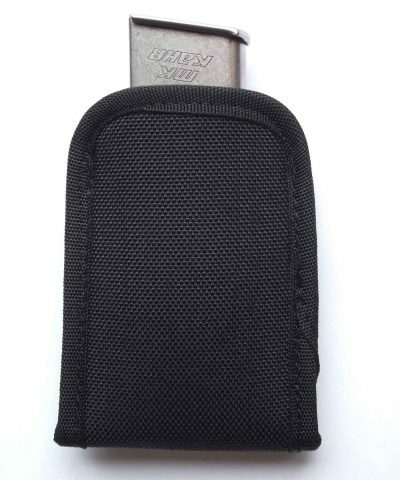 Uses waterproof, high-tech closed-cell foam for a comfortable carry and to protect your gun from moisture. This foam, with time, will conform to the shape of your gun giving you a custom fit. FINEST MATERIALS: Lined on both sides with rugged Cordura® nylon for durability and a smooth, fast draw. We use only the finest bonded nylon thread and stress point is bartacked for extra strength and durability. 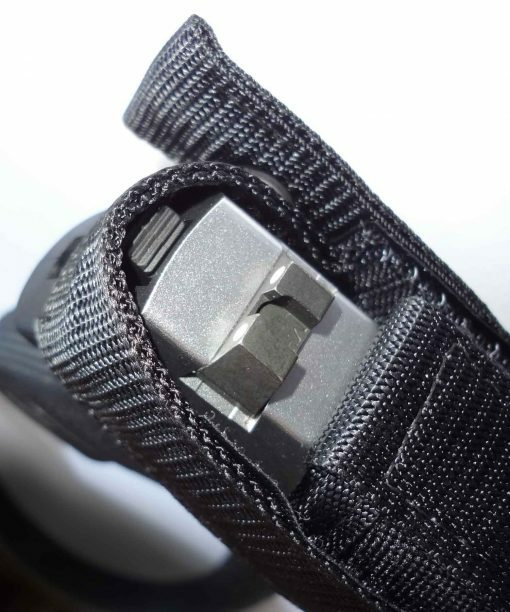 THUMB BREAK: Includes removable and adjustable thumb break for quick, easy access and to keep your gun secure. 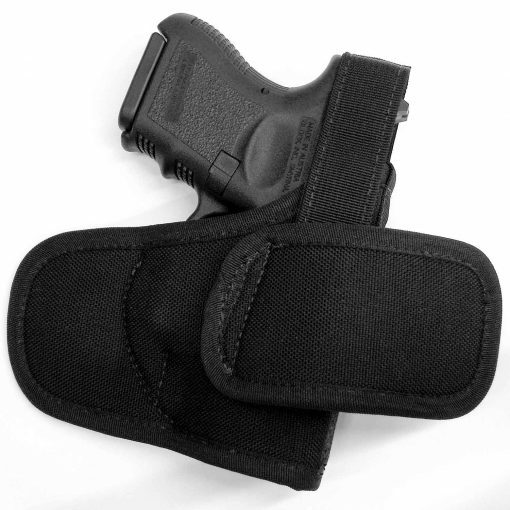 HOLSTERING: Smooth nylon webbing along the entire inside length of the holster protects your gun’s sights and keeps holster partially open for easier reholstering. BELT: Fits up to 1½” belts. The Self-Defense Guideline Card! The seven steps you must take to keep you from going to prison if you ever have to use your gun in self-defense. This card reveals, step-by-step, exactly what to do after the confrontation ends and the confusion begins. It contains vital information to protect you! If you carry a gun for protection, you can’t afford to be without this card. 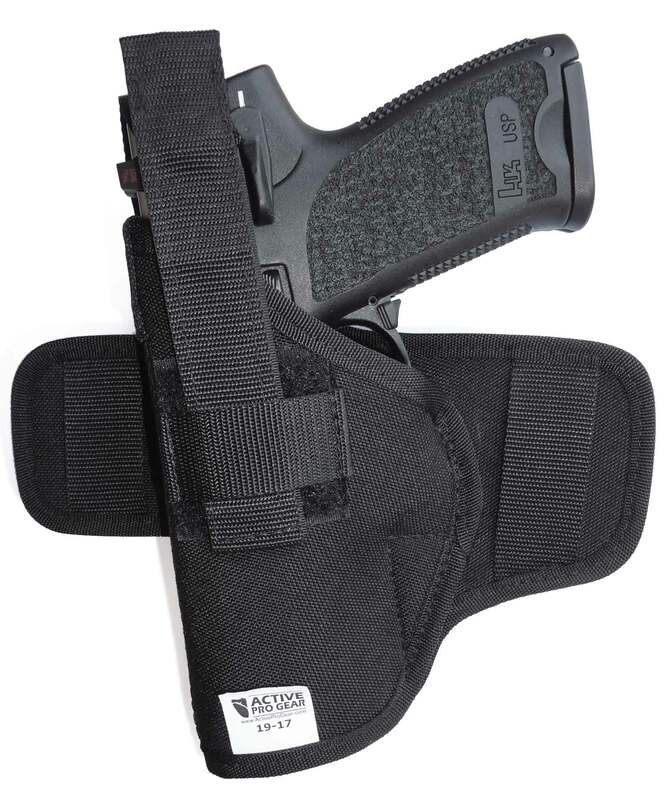 Get your card absolutely free, just by trying the OWB Pancake Belt Gun Holster for Concealed Carry —at no risk to you! Fits most handguns such as Glock 19, 26, 43, Sig Sauer P365, Beretta, Springfield XDS, M&P Shield, Ruger LC9, Taurus, Kahr, Kimber, Kel Tec, Bersa, Walther, S&W, 380, 40 Auto, 38 special, 45 ACP, 9mm and MANY MORE. Perfect for my needs. I do not like to wear a gun inside my pants but this holds the gun very close to my body and lets me conceal it with my shirt tail. Very comfortable option. I like it.